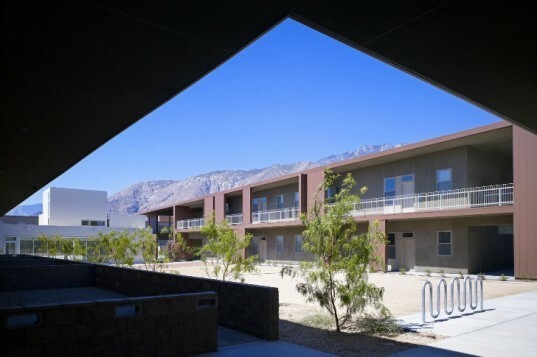 Completed in 2011, the Rosa Gardens affordable housing project in Palm Springs features 57 apartments, and it was just awarded its LEED Gold certification. When designing the project, Brooks + Scarpa sought to create an energy-efficient and high-performing housing project using recycled and sustainable materials. 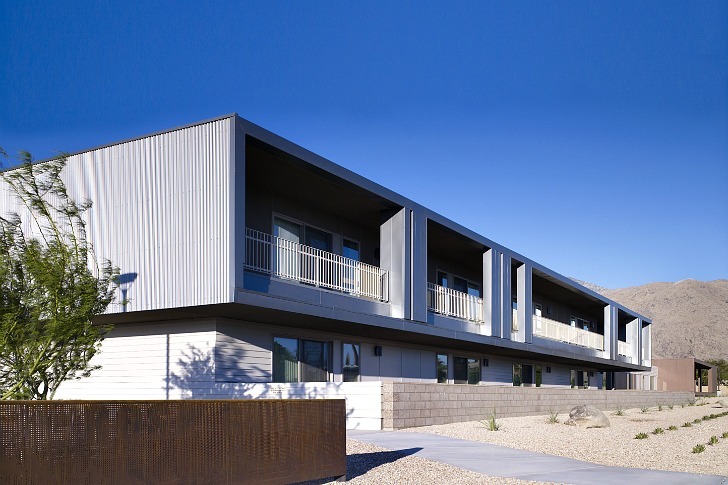 Solar passive design plays a very important role in the project's energy strategies as it works to minimize heat gain in the hot desert environment in order to keep the interior climate comfortable for the residents. Rosa Gardens was constructed on an urban infill lot and it offers 57 units of 2 or 3 bedroom apartments. The project also includes a common laundry room, a community room, a pool, bike racks, a basketball court, a recycling area, and other family amenities. Solar passive design was the driving force behind Brooks + Scarpa‘s vision – they used this green building strategy to minimize solar heat gain and energy use. Building orientation, shaping, shading, glazing, and natural ventilation were all were taken into consideration during the design phase. In total, the strategies amounted to a 30% reduction in energy use compared to California’s Title 24 standards. The team also managed to recycle more than 75% of the project’s construction materials – and many of the building materials themselves are recycled to begin with. The insulation is made from recycled newspapers, the carpet has a high recycled content, and the exterior cladding was locally fabricated from aluminum cans. The inside of each apartment features low-flow fixtures, natural linoleum flooring and CFL lighting. The project will soon install a solar thermal heating system that will provide domestic hot water and heat the pool. in the middle of a desert, i don't see a way to get recycled construction materials in a radius of less than 50-100Km. the embodied energy of recycled content increases ten folds in such cases. its a waste if we are recycling and transporting it long distances to achieve ratings. this is an anti-thesis of the word "sustainable". architects like hassan fathy were pioneers of such building typologies. using local materials should be the starting point, at least i can see stone and sand available from the images! its good to grab a green rating but one should consider the fundamentals first. Rosa Gardens was constructed on an urban infill lot and it offers 57 units of 2 or 3 bedroom apartments. The project also includes a common laundry room, a community room, a pool, bike racks, a basketball court, a recycling area, and other family amenities. Solar passive design was the driving force behind Brooks + Scarpa's vision - they used this green building strategy to minimize solar heat gain and energy use. Building orientation, shaping, shading, glazing, and natural ventilation were all were taken into consideration during the design phase. In total, the strategies amounted to a 30% reduction in energy use compared to California's Title 24 standards. The team also managed to recycle more than 75% of the project's construction materials - and many of the building materials themselves are recycled to begin with. The insulation is made from recycled newspapers, the carpet has a high recycled content, and the exterior cladding was locally fabricated from aluminum cans. The inside of each apartment features low-flow fixtures, natural linoleum flooring and CFL lighting. The project will soon install a solar thermal heating system that will provide domestic hot water and heat the pool. Deep overhangs provide critical shading to minimize heat gain. A large central courtyard provides private community space. Each apartment enjoys its own balcony. The central shared community pool is a favorite amenity.